This ranking also places Cambodia at the bottom of the rung as far as ASEAN countries go, with the exception of Myanmar which was not included in the study. Singapore, unsurprisingly, took top position in the Southeast Asian region ranking 2nd out of 125 countries. Malaysia came in at 27th, Brunei in 36th, the Philippines 58th, Thailand 66th, Indonesia 67th, Lao PDR 91st and Vietnam 92nd. While more advanced ASEAN countries like Singapore will most likely be able to breeze through the inevitable Fourth Industrial Revolution (also known as Industry 4.0), countries like Cambodia which rely heavily on agriculture and textiles, will face tougher challenges. One of Cambodia’s trump cards continues to be its relatively large youth population compared to most other ASEAN countries. The United Nations Population Fund’s (UNFPA) latest statistics reveal that 20.6 percent of Cambodia’s population is made up of those aged between 15 to 24. This, however, only works out for Cambodia if that segment of the population is nurtured into becoming a highly skilled workforce. Nick Beresford, the United Nations Development Programme (UNDP) Cambodia Country Director opines that these youth are creative and entrepreneurial, keen and able to adapt and learn. However, the GTCI paints a gloomier picture of Cambodia’s current state of affairs as far as its youth are concerned. Meanwhile, the clock is ticking. While Cambodia scored relatively poorly for the GTCI, its weakest points were in talent growth, vocational and technical skills, and global knowledge skills. 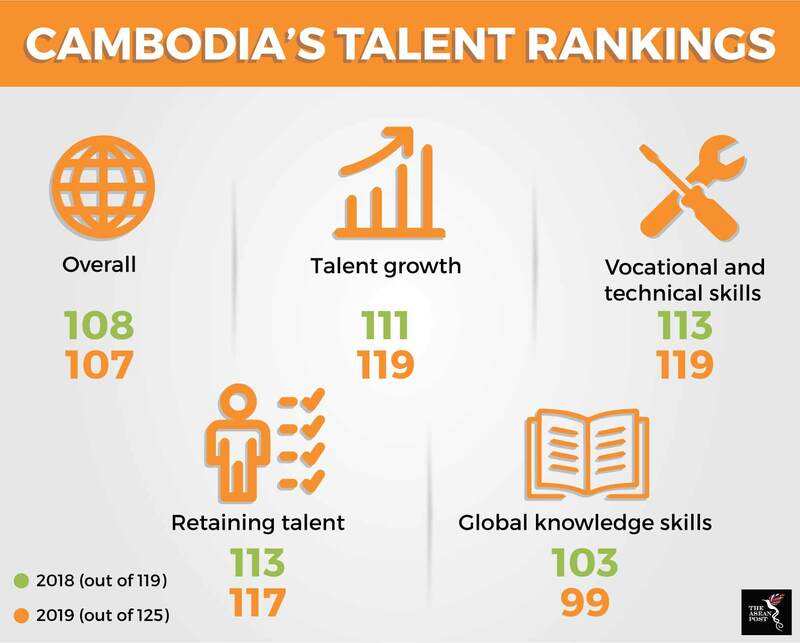 In 2018, Cambodia ranked 111th for talent growth which includes aspects like formal education, and quality of management schools. In 2019, this ranking fell to 119th. It also fell from 113th to 119th for vocational and technical skills, and from 113th to 117th for global knowledge skills. Cambodia also scored poorly for retaining talent but unlike the other three indicators mentioned above, it placed better this time around at 99th compared to last year’s 103rd. Retaining talent includes aspects like brain retention which is the opposite of the phenomenon known as “brain drain” where talent leaves the country in pursuit of better opportunities overseas. In September last year, Cambodia’s Minister of Education Hang Chuon Naron said that the government’s New Generation Schools (NGS) programme will soon be rolled out to 200 selected schools in all 25 provinces. The programme aims to promote the role of technology in schools by building well-equipped ICT labs and encouraging student-led learning by training teachers to apply innovative teaching methods. Later, in November 2018, Hun Many, chairman of Cambodia’s National Assembly’s education commission held a meeting with Education Minister Hang Chuon Naron to discuss the government’s policy on NGS. Hun Many is in favour of implementing NGS programmes across the Kingdom, saying that its implementation will modernise the country’s education system. The programme, however, has been criticised for discriminating against poor students who cannot afford NGS books and materials. Students who wish to attend the programme must also take an entrance exam in science, technology, engineering and mathematics. Three schools have so far been selected to host the NGS programme: Preah Sisowath High School in Phnom Penh, Angkor Chor Primary School in Kampong Cham province, and Samdech Primary School in Kampong Speu province. The NGS seems to be the answer to Cambodia’s problem of upgrading its youths’ skills to be better prepared for Industry 4.0. Nonetheless, the Kingdom must ensure that in its pursuit to make a few become better and brighter students, it does not forsake the many who may be left behind. Regardless of how Cambodia decides to approach its challenge of creating a more competitive workforce, it must decide quickly or risk playing catch-up with other ASEAN member states.